The Db2 Warehouse client container provides a toolkit that has very nice utility scripts that can be downloaded from http://ibm.biz/db2warehousetools . dbsql – This is like Db2 CLP but based upon Netezza command tool nzsql. Scripts available in the tool are shown below. You can test these commands by providing -d switch with the name of the database alias that was generated in the previous section. 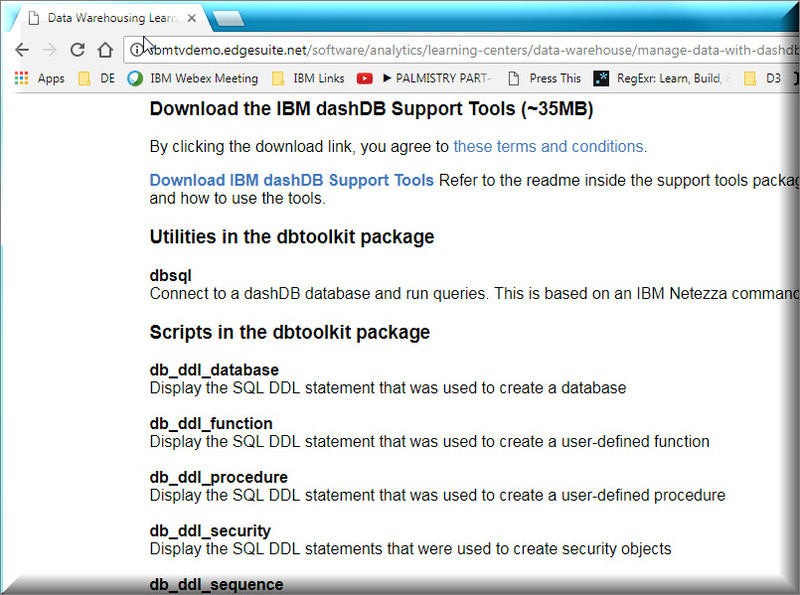 db_ddl_database – It shows the script that was used to create a database. Use the alias name generated. db_ddl_function – To generate the DDL used to define user defined functions. db_ddl_procedure – To generate DDL for user created stored procedures. db_ddl_security – To generate DDL for security objects. db_ddl_view – To generate DDL for user defined views. db_genstats – To generate statistics on tables that do not have up-to-date statistics. db_getstats – To get statistics on all tables or for a specific table.